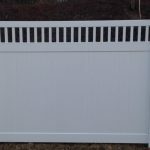 Vinyl Fencing – Precision Vinyl Systems, Inc. 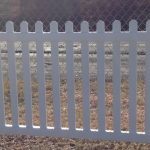 Here are few of the Vinyl Fencing styles available. Contact us to review the full selection. 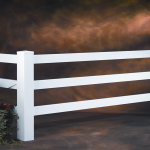 Don’t forget to check out Fence Caps, Solar Caps and other accessories available on our Hardware & Accessories page. One Section Includes: 1 - Post 4" x 4" x 6ft. 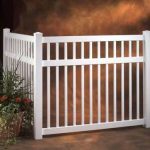 3 - Top/Mid & Bottom Rails: 2" x 3.5" x 6'w or 8'w Pickets: 7/8" x 1.5" Spaced approx. 3-7/8" apart 1 - Horse Cap Additional caps may be selected, just let us know which caps you would like. 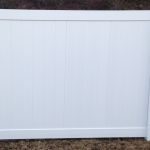 Gates available in Standard 3ft. or 4ft. Width or Custom sizes. Gates are shipped assembled and include all hardware. Almond & Khaki is available at a 20% additional cost. Section are sold unassembled. Thank you for looking at our products to receive a quote please call (570) 636-9878 or you may fax a drawing with your dimensions to (570) 636-3931 be sure to put your name, address, phone number and email address on fax. Thank you! 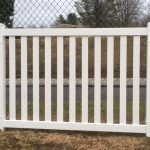 Precision Vinyl Systems, Inc.
Closed wide picket. Also known as pool fence. We can make any size. Pickets are 7/8" x 3" & post can be 4" or 5". Convex or reversed scallop picket. 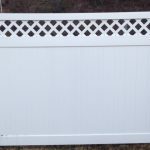 Vinyl Privacy w/Lattice Top Fence. Standard is 6'H X 8'W. Other sizes available. Aluminum channel in bottom rail. 5"x5" Post are standard. White, Almond & Khaki available. Add 25% for Almond & Khaki. 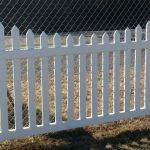 Privacy w/Picket Top Accent Fence. Standard is 6'H x 8'W. Other sizes available. Aluminum channel in bottom rail. White, Almond & Khaki Available. Add 25% upgrade for Almond & Khaki. Good Neighbor Scalloped Picket Fence. Many sizes to choose from. 4"x4" post are standard. Post are routed for fence rails. 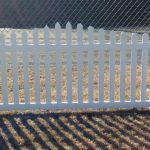 Good Neighbor Straight Picket Fence. Many sizes to choose from. Rails are routed for pickets to slide through. Looks the same on both sides. 4" x 4" post are standard. Post are routed for rails. Standard picket size is 7/8" x 3". Many choices of post caps available.